Inspired by the 1893 World's Columbian Exposition in Chicago and its National Garland of Flowers, Vermonters were determined to adopt an official state floral emblem that would uniquely represent their state. On October 19, 1894 a concurrent resolution to adopt an official flower was introduced in the Vermont House. A special committee, comprised of one member from each of Vermont's fourteen counties, took the matter under consideration. Vermonters campaigned hard for their favorites. The daisy, trailing arbutus, the posy, mayflower, the buttercup, and red clover were among the flowers preferred by citizens of the state. When all the votes were counted, the red clover won the day with 9,575 votes, a resounding statement from the state's farmers. The daisy followed with 2,569 votes and the buttercup garnered third place with 945 votes. On November 8, a bill was amended to specify the red clover as the state's official flower. 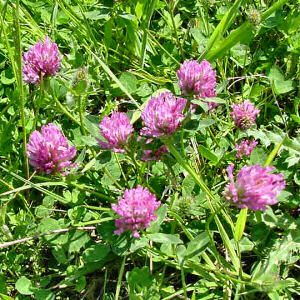 The next day, on November 9, 1894, the red clover was adopted as the state flower by the Thirteenth Biennial Session of the General Assembly with an effective date of February 1, 1895. No. 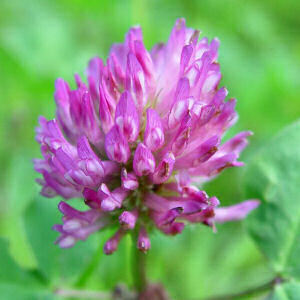 159 of the Acts of 1894, effective February 1, 1895, designated the Red Clover as the official State Flower. Both an integral part of many a cultivated hay field and a common sight along numerous Vermont roadsides, the Red Clover is symbolic of Vermont's scenic countryside generally and of its dairy farms in particular. Oddly enough, however, Trifolium pratense is not a native of Vermont but was "naturalized" from Europe. ------ from Office of the Secretary of State, Vermont Legislative Directory and State Manual,Biennial Session,1993-1994,p.15. The following information is excerpted from the Vermont Statutes , Title 1 Chapter 11, Section 498. The state flower shall be the red clover. Trifolium pratense (Red Clover): Plant Encyclopedia from MyGardenGuide. Plant Profile for Trifolium pratense (Red Clover): USDA, NRCS. 2004. The PLANTS Database, Version 3.5 (http://plants.usda.gov). National Plant Data Center, Baton Rouge, LA 70874-4490 USA. Trifolium pratense L.: Purdue University Center for New Crops & Plants Products. Source: The National Geographic Magazine, Volume 31, Number 6. "Our State Flowers." Page 483. 1917.